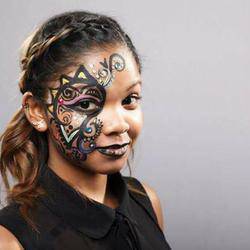 Christy's Facepainting seeks to add that special sparkle to any party, our team of talented artists ensure that any occasion is fun and full of colour. This is our fourth year running and we are having more fun than ever before! We use special imported non-toxic water based paint that is of the highest quality, is non allergenic, FDA Approved and is safe to use on anyone with sensitive skin. 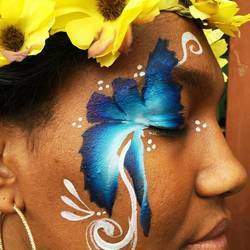 We now offer: exciting glitter paint parties, special effects, henna and professional make up. We do year end functions for both adults and kids, our past corporate clients include: Nedbank, RMB, FNB, Standard bank, Anchor Capital, Where Next Events, P&G, Tinswalo and Steinhoff Int. I had face painting done for a Halloween Party and Mya’s work was incredible. I had many people asking for her details. Christy and Mya were both professional and communicated very efficiently with me regarding my booking. I would definitely use them again! 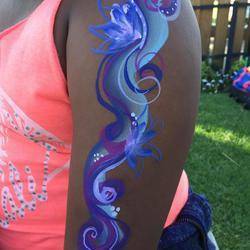 Oooh wow, I was really impressed with Christy and her teams proffessionalism and the stunning face paintings they did for kids at my daughters birthday. They were really thrilled. Thank you so much for making my daughters day memorable.It was really a pleasure working with Christy from the day I was just makig enquiries right until the day. Thank you so much for your professionalism and promptness in attending to my request and showing up on time for my daughter's special day. I was also impressed with your patience towards the kids and your kindness to everyone. Thank you, wishing all the very best in your future endeavours. Having Christie’s face painting was an Absolutely perfect addition too our 4 year old daughters party. Francesca was extremely professional and painted beautifully. I would recommend Christie’s face painting without hesitation. An effortless and efficient experience. Christy was fantastic. The kids were ecstatic. Highly, highly recommend Christy. What an amazing experience. Christy really brought an professional beautiful touch to our function.